When we were trying to conceive I must have spent $100... $200+ (I'll stop there)...on Pregnancy Tests. That's not a lie and it's easy to reach, believe me. I couldn't stop testing because I was constantly praying it would happen and the day I tested would be the day I saw the +/-, two lines, or "Pregnant" across the screen. The worst thing I ever did was take a blue dye test. I do not recommend if you're are looking to find out if you are, to take any with blue dye. For some reason they have a lot of errors, the lines are faded or you may get a false positive. The month we did conceive I purchased a new box of digital Clearblue tests and when I saw "Pregnant" I cried. I knew in my heart that there was no way it was wrong. That was my ultimate yes you are pregnant Katie. I cried my eyes out as I showed Charlie and said "it's real this time!" It happened! The greatest part was that I could see if we were progressing. A week later I took another and of course it went from Pregnant to and additional 1-2 at the bottom. Then a few weeks later I took yet another for the comfort of seeing 2-3 and then 3+. I was sad when I didn't need to take them anymore and I'm not going to lie... I may have snuck one in around 5 weeks just to still see 3+ pop up on that screen. I reached out to Clearblue to thank them for the product and confirming our beginning with Autumn Lily. Above was a beautiful gift that Clearblue has sent Autumn and myself that arrived today. 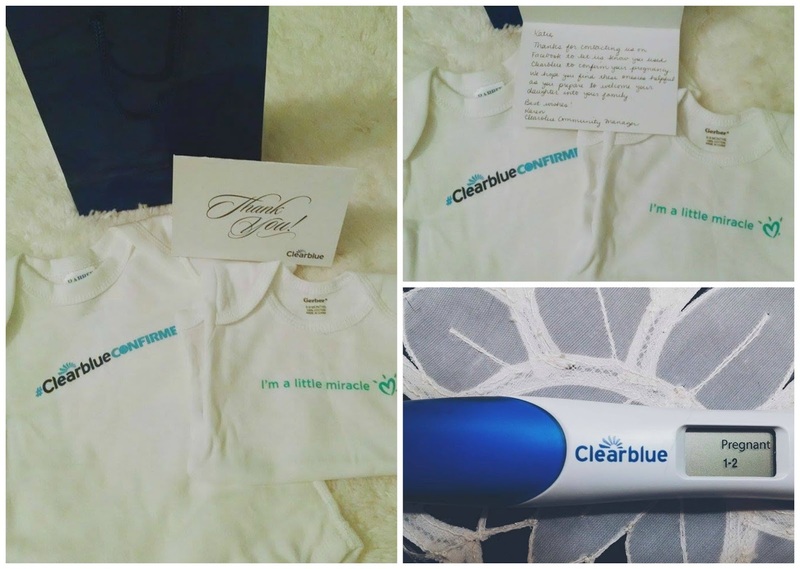 A personal, handwritten Thank You note from Karen the Clearblue Community Manager, a onesie with their logo and the onesie I'm head over heels in love with that says... "I'm a little miracle" as Autumn is truly without a doubt our little miracle that we are so thankful for each day. Thank you so much Clearblue!! #92: Making brownies and sitting there while we both take spoons out and lick the remaining chocolate in the bowl!